After experiencing that beginning of winter skin freakout, I’ve been on a real skincare kick. After getting the dryness and irritation under control, I’ve really enjoyed layering different products that I have and the whole ritual of morning and evening skincare application – it’s been more than simply going through the motions for me. Recently, I’ve discovered a few products in my arsenal that I haven’t reviewed as of yet but want to share my thoughts on. 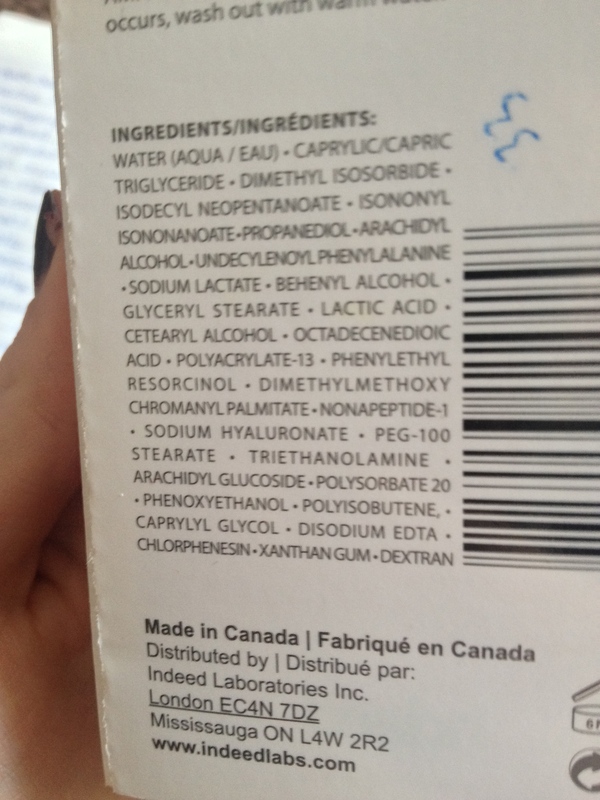 The Ordinary Lactic Acid 10% + HA 2% ($6.70 CDN/ 30 mLs) is one of these products. 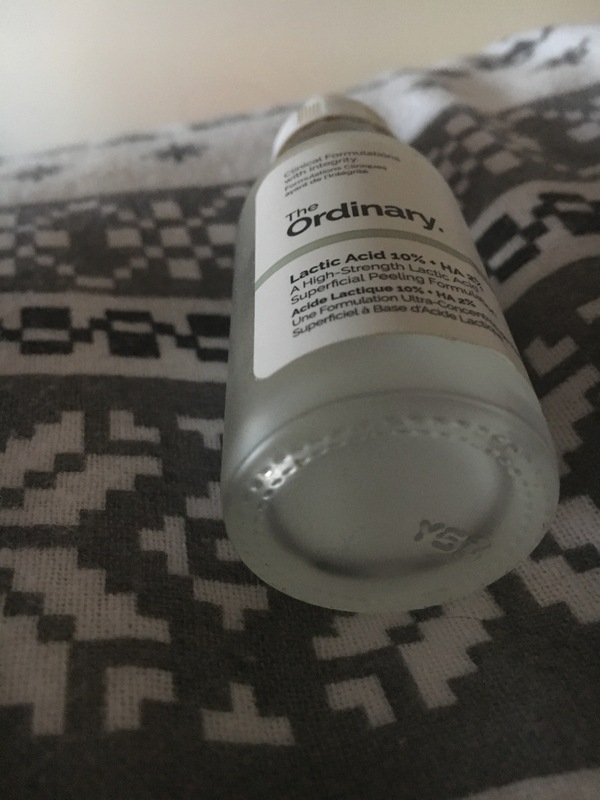 For the sake of this post not being a few thousand words, i won’t get into the controversy over Deciem’s ownership and their ex-CEO – The Ordinary is one of the many brands under the Deciem umbrella. This product is a simple chemical exfoliant formula with some hydrating and soothing properties. It contains 10% of the alpha hydroxy acid, lactic acid to gently exfoliate the surface of the skin, help to unclog pores, smooth and hydrate the skin’s surface and decrease the look of imperfections and discolourations over time. I will emphasize that this won’t exfoliate the pore to the same degree as salicylic acid does so if clogged pores are your primary concern, I’d be more tempted to try salicylic as your chemical exfoliant of choice. It did do all of these things mentioned above in a gentle fashion because it’s formulated at the correct pH and does not contain irritants such as drying alcohols, or irritating plant extracts and essential oils. It performed well as a gentle alpha hydroxy acid exfoliant for me but I will note that I didn’t notice a real wow impact of using it compared to other products in the category upon first use. However, I may be biased because I continuously use acids in my regimen. It definitely helped to even out the texture of my skin and to keep my skin clear but I found this lactic-acid based exfoliant shined at drawing moisture back into my dehydrated skin. The formula does include 2% hyaluronic acid which is incredibly helpful as a humectant, especially in combination with lactic acid and glycerin. Another novel ingredient of note in the formula is the Tasmanian pepper berry that has research indicating that it has excellent anti-inflammatory activity and can function as an antioxidant. I believe that the addition of these soothing and hydrating ingredients play a part in how gentle the formula is whilst being effective. Ingredients: Aqua (Water), Lactic Acid, Glycerin, Pentylene Glycol, Propanediol, Sodium Hydroxide, Sodium Hyaluronate Crosspolymer, Tasmannia Lanceolata Fruit/Leaf Extract, Acacia Senegal Gum, Xanthan Gum, Isoceteth-20, Trisodium Ethylenediamine Disuccinate, Ethylhexylglycerin, 1,2-Hexanediol, Caprylyl Glycol. The acid is housed in a frosted glass bottle container with a dropper, which works well to dispense the gel-serum texture of the exfoliant. I suppose it’s slightly sticky in texture but most skin types will need to apply something over the top in order to seal the moisture into the skin (as it contains humectants) and consequently, the tackiness should not be an issue. The dropper works well for the fluid texture of the product and I don’t believe that this product contains anything that could be compromised by this packaging style. It feels lightweight and hydrating on the skin, quickly sinking in. If you’re interested in trying a water-binding acid exfoliant, I’d highly recommend trying this one. It’s not complicated and is effective and gentle at a very affordable price tag. I do find that I go through the bottle a little more quickly than some other acid exfoliants but it’s so affordable that I don’t care. It’s free of animal testing, I believe. I will note, however, that the formula isn’t as robust as some of the much more expensive exfoliants I also enjoy from Paula’s Choice. Skincare products can be difficult to judge as they’re not something that you’re measuring the results of for merely the time the product is sitting on your skin. I’m aware I’m not having my most articulate moment here but I refuse to give up on this post that is long enough overdue as it is. Retry time. 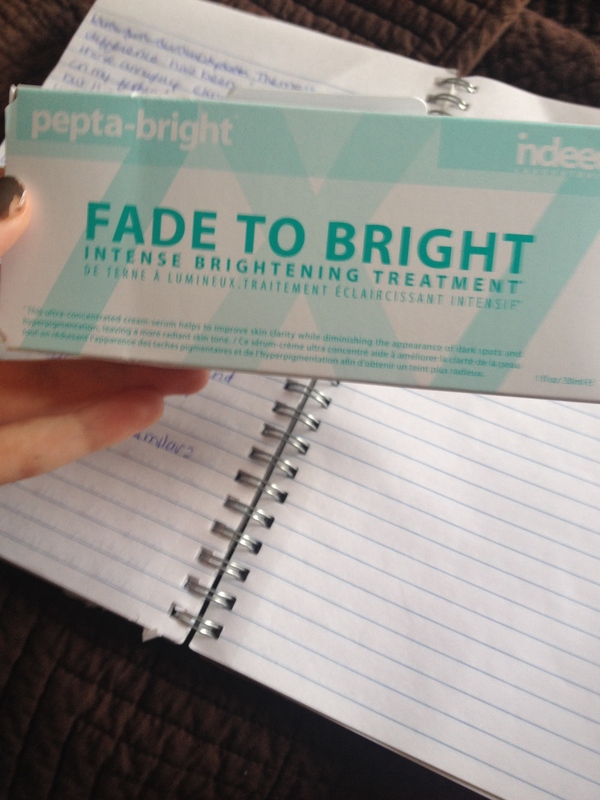 Skincare is difficult to review fairly because its effects are more difficult to judge because they tend to be long-term, rather than merely covering-up the skin they aim to improve the skin itself and said difficulty is why I don’t write many skincare reviews but I feel confident enough to provide my verdict on the Indeeds Labs Pepta-Bright, as I’ve been using it since October and have seen results without making any other significant changes to my skincare regime. The serum retails for $40 CDN (at Shoppers), 25 GBP (at Boots) and can be picked up in the states as well in Walgreens. Long-story-short this is a brightening cream serum containing 30 mLs of product in a compact white tube. Our promise is to deliver the most advanced peptide based skin brightening treatment. Pepta-Bright is a combination of 7 powerful active ingredients which target 7 biological factors. This cream-serum is designed to improve the appearance of hyperpigmentation, age spots and uneven skin tone. The unique formula is lightweight yet rich in texture. Pepta-bright helps to reduce the intensity of dark spots while promoting overall skin clarity and brightness, leaving a luminous and radiant complexion. You’ll be surprised by how fast you will see results! From my previous research and trial and error along with checking the always-helpful cosdna, there does not seem to be any overly harsh or commonly irritating ingredients in this offering – but as always everyone has different skin but mine is incredibly sensitive especially to drying alcohols and I’m pleased to report there are none. This serum is essentially a chemical exfoliant with lactic acid as its active ingredient with a hydrating base containing glycerin. It’s as intense as promised but gentle at the same time (not an oxymoron, I promise) in the sense that it’s free of harsh additives yet it’s a concentrated chemical exfoliant so you’re getting a whole lot of bang for your buck. It doesn’t irritate my easily irritated skin but it can tingle uncomfortably on skin that is already irritated. In my trial of chemical exfoliants in the last year, I’ve learned that results are not immediate but with continued use dramatic results do occur. I’m not going to hide my bias toward this product; with continuous use since the beginning of October, it’s become one of my very few hero skincare products. 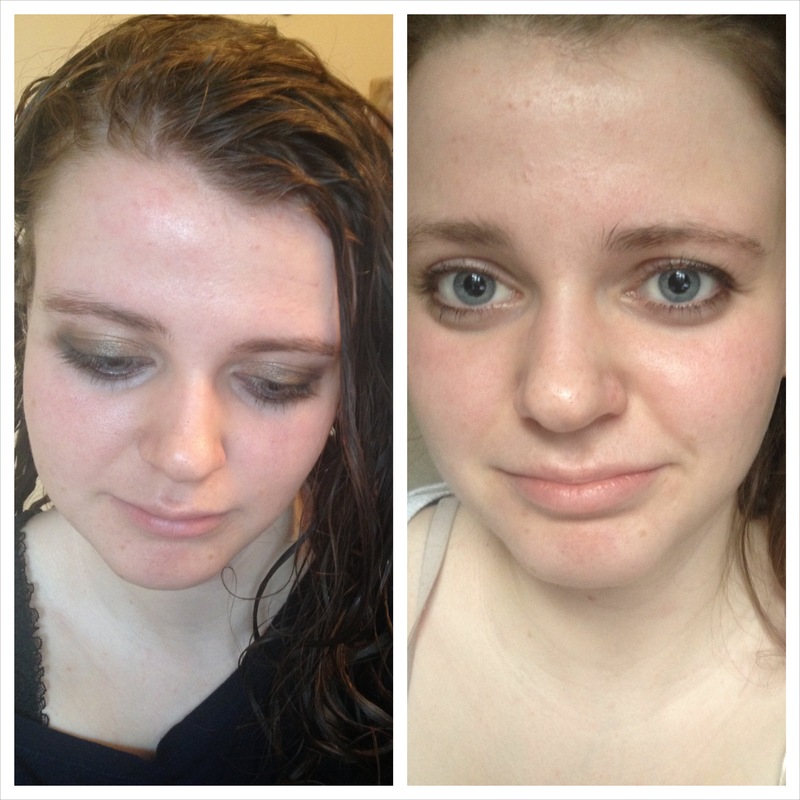 Now I can safely say that it’s provided dramatic results that I’m happy with but I didn’t really see results until two-three months of use regardless of how frequently I applied the product, yet the results were dramatic when I could see them. It’s a testament to this products effecacy that since the results have become visible to me I’ve also received lots of compliments on my skin from friends that I see on a daily basis and this has been the only variable in my routine. You can probably extrapolate my general skin condition and concerns from what I’ve said here but I thought further detail would be helpful; I have dry, dehydrated and easily irritated skin prone to redness, congestion, clogged pores, scarring and all sorts of lumps and bumps. In other words, my skin is naturally uneven and dull, lacking clarity and this has tremendously helped. The most dramatic difference has been in the decrease of those annoying clogged-pore bumps on my forehead, cheeks and chin but I’ve noticed fading of the scars that always accompany my breakouts as well as a more radiant and even complexions. 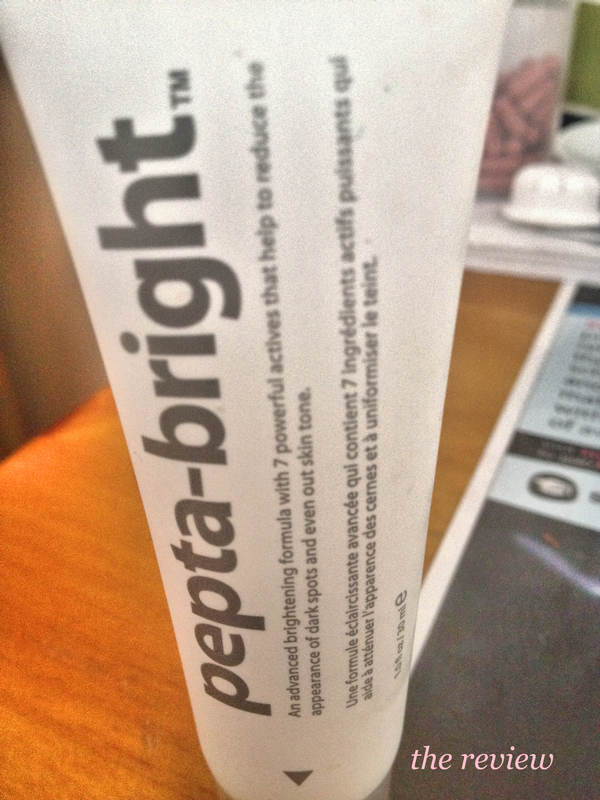 As most products seem to be, Pepta-Bright is marketed with almost-otherworldly claims (“the most advanced”, anyone?) but I think it actually does achieve on said claims. If you suffer from dullness, unevenness and the like, you need this treatment. It’s made its way into my nightime routine 3-4 times per week and I cry when I think about it leaving anytime soon. Take this from a skeptic and cynic like myself, this falls into the magical baby unicorn tears category. Have you tried this or anything similar? I’m always open to recommendations!